1. Cook the peas in boiling water for 2–3 minutes. Drain, refresh under cold water then drain again and pat dry. 2. 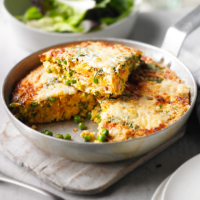 Beat the eggs with plenty of seasoning and fold in the flaked fish and the peas. Melt the butter in a 20cm deep non-stick frying pan until foaming and add the egg mixture. Cook for 4–5 minutes over a medium heat until the egg is set and the base is golden, lifting up the middle of the mixture during cooking with a spatula to let the egg run under and set.